Champville (Pepsi LBL) strengthened their roster with addition of 31-year old American forward Brandon Costner (206-107kg-87, college: North Carolina State). He played last summer at Hebei Xianglan in Chinese NBL league. In 16 games he recorded very impressive stats: 30.4ppg, 12.3rpg and 3.4apg. He attended North Carolina State until 2009 and it is his ninth season in pro basketball. The list of the past achievements is quite long as among others Costner played in the final of Chinese NBL in 2014 and 2016. 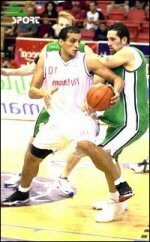 He was also voted Latinbasket.com All-Puerto Rican BSN Center of the Year in 2016. Costner is quite experienced player. Thanks to his pro career he managed to play on four different continents (Europe, Asia, Latin America and of course North America) in six different countries. Costner has played previously professionally also in Belgium (Belfius Mons Hainaut), France, Puerto Rico (Gallitos), NBA G League (South Bay Lakers), D-League (Utah F.) and China (Monkey Kings and Guizhou).